Dazzling colours and a pleasure to apply. All the magic, refinement and know-how of Yves Saint Laurent can be found in this lipstick which combines pleasure of the senses, bright colours and total comfort. Both light yet rich, its creamy texture becomes fluid on contact with the lips for a pleasant feeling and incredible smooth-on qualities. My first purchase from YSL, I blame Gaea for this :D She had done a post on IMBB showing off her YSL lipstick, and when I met her I just had to drag her over to the YSL counter and pick this up for myself. See, its totally her fault, right? Superbly pigmented..the slightest swipe deposits so much colour..I am still wow. This particular colour is perhaps a tad too bright for me, but I still like it :D :D The swatch on my hand is what it actually looks most times more than the swatch on my lips. The design of the case shows a bit of the colour with the logo over it. The colour outside is exactly what is the colour of the lipstick. I have always had a fascination for peel-off masks. Guess anyone who has "accidentally" squeezed out more than the necessary quantity of Fevicol would agree with me :D :D Unfortunately for me, although I have bought many peel-off masks (not naming brands but some really popular ones are the orange yummy-smelling ones) they haven't really done anything for my skin; some have even left me looking quite a few shades darker!! Not really something I was aiming for, so for quite some time, playing with Fevicol was the only way to satisfy the peel-off craving :P :P A few days back, though, I found the Himalaya Herbals Almond-Cucumber peel-off mask. Unclogs pores. Peels away blemishes to leave a healthy, glowing skin. Almond nourishes, soothes and softens the skin. Cucumber tones your facial skin and provides cooling effect. Pineapple removes impurities and dead tissues and firms up the skin. Indian Gooseberry (Amla) has cleansing and anti-oxidant properties. Cucumis sativus (Cucumber, Trapusha) has an enzyme that helps keep the facial skin soft, has a healing and soothing effect on damaged skin and is a natural sunscreen. It acts as a toner and lightens facial skin. Emblica officinalis (Indian Gooseberry, Amalaki) has cleansing and antioxidant properties. Prunus amygdalus (Almond, Vatada) has soothing, softening and non-sensitizing properties on the skin. It also moisturises the skin and cleanses. Ananas comosus (Anannasa, Pineapple) has astringent and anti-inflammatory properties. It helps in removal of foreign material and dead or damaged tissue and also acts as a cleanser. The product itself is a runny pale greenish lotion-like liquid, easy to spread in a thin layer. Apply evenly over cleansed face and neck, avoiding the area around the eyes,. Allow it to dry for 10-15 minutes. Gently remove the peel from the side of the face. Use once or twice a week. Do not apply on broken or inflamed skin. My experience with this: I applied it evenly, not too thick or too thin. It took ages to dry, definitely more than 10-15 minutes recommended. However, once dry it does come out easily enough. I usually wash off any residue from my face with cold water. I did have a bit of a burning sensation in some areas of my face after I peeled off the mask, and I think washing with cold water helped ease it off. Not something very serious, but people with really sensitive skin might want to be careful with this product. As mentioned on the pack, definitely not meant for inflamed or broken skin, as it would easily peel off delicate skin! Is quite reasonably priced and affordable. Cost: Rs. 100 for 75 g.
It leaves my skin fresher and cleaner looking. In my opinion, a peel-off mask works because it peels away any dull dead skin on the surface layer, and this mask seems to do it quite effectively. It did not cause any skin irritation or darkening or break-outs FOR ME. I feel it would be safe for the general population, but as mentioned earlier, avoid using this mask or any peel-off mask if you have delicate skin, inflamed or broken skin, simply because once dry these masks would tend to pull off any loose skin causing more injury. After removing the mask, wash face with cold water to remove any residue you might have missed and also to give a soothing effect. Himalaya has for some reason chosen only to put the key/active ingredients on the tube. I would have preferred if the entire list was there. We as customers have the right to know what we are putting on our faces, and please leave it to us to decide whether we want to use something or not. I hate the "key ingredients" concept. They do put the entire list on their Neem Mask, so I do not know why they did not do so here. Ingredients: Each gram contains: Extracts: Anannasa 25 mg, Vatada 15 mg, Trapusa 10 mg, Amalaki 5 mg. That, with a bit of googling, is Pineapple, Almond, Cucumber, and Gooseberries. I have the first three items on the list. The rest I am planning on trying sometime soon. Both the scrub and the lotion have a refreshing citrus smell - really good. Refreshing citrus-scented soak soothes, cleans, and deodorizes hot, tired feet. Helps soften calluses and dry hardened skin on feet. Contains special moisturizers and skin softeners which leave the skin feeling refreshed and stimulated. This product has a fresh, citrusy smell and looks like a runny conditioner. Pour 4 capfuls in about half a bucket of warm water. Stir gently to mix. Soak feet, rinse off, towel dry. Avon Foot Works Refreshing Citrus Foot Soak Key Ingredients: SLES, TLS, Glycerin, Ginger/Pineapple/Carrot/Green Tea. Rich in sea salt and volcanic pumice to slough off dry skin and calluses to leave feet softer, noticeably smoother. Green Tea and Pineapple, known for their anti-inflammatory benefits, help soothe irritated, stressed skin. Massage a small amount over feet focussing on the driest areas. I soak my feet for some time in warm water or a foot soak, then apply the scrub, and use gentle round scrubbing motions with either my hands or a foot file to exfoliate. Wash off to super smooth skin. Why I picked a liquid liner to be the first product I would try out from NYX, I really don't know, except it seemed like the only item I would actually use. 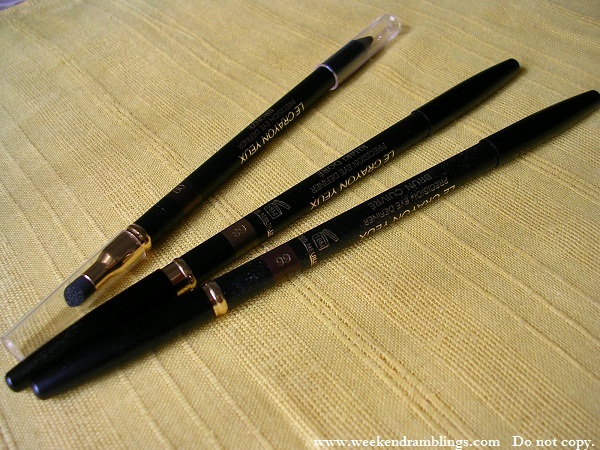 My Lakme eyeliner is really old and needed replacement. 1. Cost: An affordable drugstore brand abroad, NYX seems to feel in India we won't mind paying a bit extra. Well, I did buy it, so maybe they are on to something :D Cost: Rs. 350. Since its "Made in Korea," which I thought was closer to India - travel distance - shouldn't it be cheaper in India than it is in the farther off USA?? :D :D Lakme eyeliner, on the other hand, is so old and ancient, I have no clue if this is even sold any more, but one thing I am sure of, it definitely did not cost me anything close to Rs. 350. 2. Packaging/Design: The tall, slender twig of a bottle holds an equally tall twiggy wand for applying this liner. I have smaller fingers than the average human, and so this long wand is a pain to use. Bottom: Lakme has a smaller wand that is really much more convenient to use with it's design. 3. Colour/Product: NYX shade is Dark Brown - is almost black, but not quite. While I don't have any problem with the shade, my problem is with the product itself. I can feel it on my eyelids. When it dries and settles down on my eyelids, I feel like there is something there. With Lakme, I don't feel anything at all. 4. Waterproof test: NYX does not claim the product is waterproof, and it is not. A good thing only for me, I think. I am too lazy to use makeup removers and then wash my face. With this, it will all go off with just plain water and some soap. Lakme says water resistant on the bottle and stays on a tad longer and leaves a faint line after washing off with just water. Verdict: The chances of me buying this product from NYX ever again? A big fat circular O for ZERO. This might work for others, and I still like the almost black but actually brown shade. Its just not convenient to use for me. Olay Dual Action Cleanser Pore Scrub is a 2-in-1 dual-action foaming formula with both cleansing and exfoliating functions. According to Olay, it removes 2 times the dirt than just basic cleansing (I guess with a regular foaming cleanser) and because of the exfoliating properties, it helps refine skin and minimize appearance of pores. I am not sure about the "two times more" statistics and comparisons, but this is cleans my face very well, leaves it a bit smoother, and it is an oil-free product. The packaging has a pump dispenser. Olay Dual Action Cleanser Pore Scrub is packaged in a sturdy plastic bottle with a snap-on lid. You can see the product through the container, and it looks like pretty swirling ribbons of pale green and white. There is a pump dispenser that dispenses the product without any hassles and you get a swirl of pale green and white with some very fine granules scattered in it. The amount I have taken is how much I would need for a one-time use. This lathers very well, and the scrub particles in it are very fine. The scrub to face wash ratio in this is just perfect. I have not used other face scrubbing cleansers, but I find this perfect. The scrub bits are very non-irritating too. It is a daily use scrub-cleanser, and it can be easily used every day without skin getting irritated. 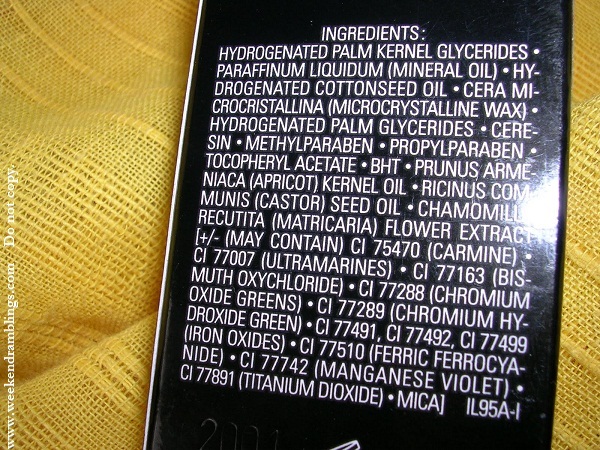 This has salicyclic acid listed as one of its ingredients. This is superb for oily, acne-prone skin. However, it does seem a bit drying to me in the winters or when my skin is having an occasional dry patches day. I do have oily-combination skin, though, so oilier skin types might not find this an issue. Any dryness I might feel after using this cleansing scrub does go away easily enough with moisturizing. The scrub does take a bit of time to wash off - nothing too much but it does tend to stay on the skin longer than most other face washes I have tried. I have to admit, though, I am a bit lazy and want stuff to just magically disappear off my face with random splashes of water 😂. The consistency and formulation of the cleanser is perfect for everyday use as a facial foaming cleanser and mild exfoliation combo. Regular use would ensure you have smoother, cleaner skin. Olay Dual Action Cleanser Pore Scrub - Ingredients: WATER, SODIUM LAUROAMPHOACETATE, GLYCERIN, OXIDIZED POLYETHYLENE, SODIUM TRIDECETH SULFATE, SODIUM MYRISTOYL SARCOSINATE, ACRYLATES COPOLYMER, SORBITOL, PEG-200 HYDROGENATED GLYCERYL PALMATE, SALICYLIC ACID, PEG-100, PEG-7 GLYCERYL COCOATE, CITRIC ACID, TITANIUM DIOXIDE, DISODIUM EDTA, FRAGRANCE, BHT, PANTHENOL, ASCORBIC ACID, METHYLCHLOROISOTHIAZOLINONE, METHYLISOTHIAZOLINONE, CHROMIUM HYDROXIDE GREEN. Colour Riche® Nurturing and Protective Lipcolour with Omega 3 presents Colour Riche® Star Secrets. The secret is their color. What's your signature shade? L to R: Mila Plum, Kerry's Rosewood, Aishwarya's Beige, Andie's Rose Carmine, and Diane's Tuberose. Some of these colours might not be available any more. L'Oreal keeps changing the colours/celebrities they pick for these lipsticks, I think, because I never found the Aishwarya's Beige when I went looking for it again. Precious Pearlescent collection by TBS for Fall 2009. Sundown Glow - Darker Brown, a golden brown, creamy beige. I find them a bit too frosty - especially the TBS Moonlight Lusture Eyeshadow Trio - but they are very smooth, pigmented, and overall quite awesome. 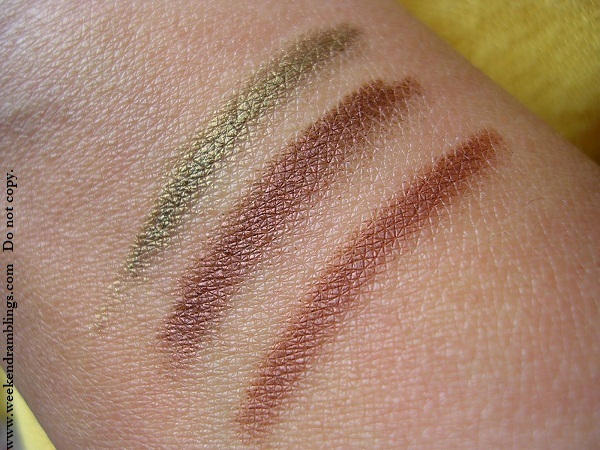 My favorite among the two would be the brown trio - TBS Sundown Glow Eyeshadow Trio. 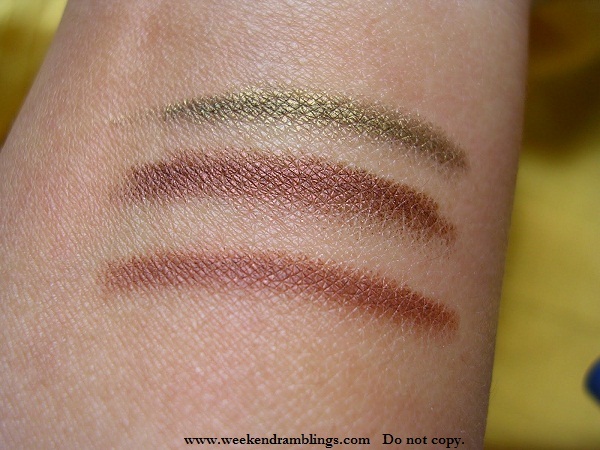 Which is your favorite Bodyshop eyeshadow? 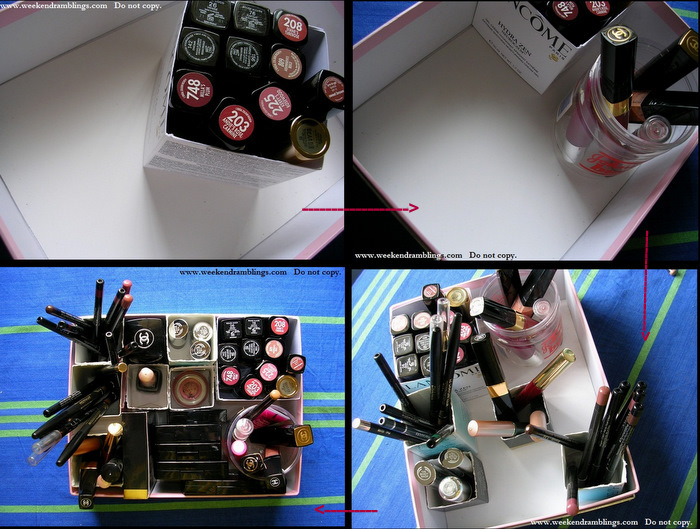 I have this image from ages back, my mom had 2 or 3 lipsticks and a foundation - of course, Lakme - that was her makeup. And the Lakme loose powder. My dad had taken an empty toothpaste cover/carton and punched holes in it so she could stand these in them. I don't know if either Ma or Pa even remember this, but to this day, it always brings a smile to me when I think of it. Guess that was my first lesson in the 3Rs - reduce, reuse, and recycle. I had planned on Operation Clean-up today, and partly with memories of my mom's old toothpaste cover stand and some posts on internet, I decided to use up all the empty covers I had been saving up with this vague idea. Hmmm..This is not working very well for me, but I am going to be more careful about what I buy. Read more reviews and don't just buy because it looks cute. 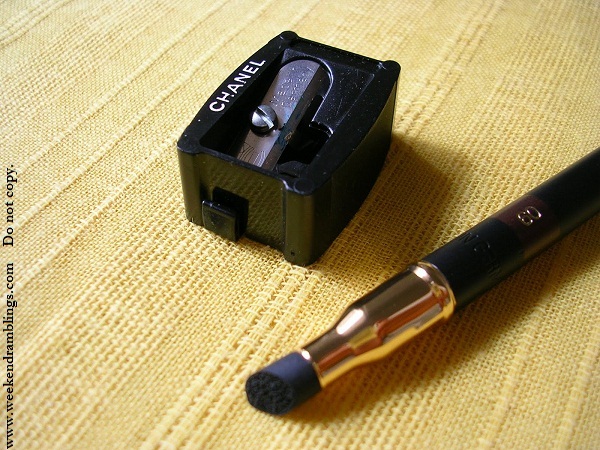 According to the Chanel website - Line eyes quickly and easily with an eye crayon that achieves a variety of effects, from a subtle yet precise look, to a more dramatic definition. The built-in smudge applicator perfects a smoky eye look, while a companion sharpener ensures the pencil is always ready for lining. I have these in 3 shades: Khaki Dore, Brun Cuivre, and Bronze. These two have a bit of a shimmer to them..its not glitter, just a golden shimmer. Is very difficult to explain, and I really haven't seen the same effect in other brands (I have only seen swatches online or swatched some in-store, I never bothered to buy anything else). Bronze - Again, a reddish-brown with a teeny tiny hint of shimmer. This is a discontinued shade, and I got it as a gift with purchase. It's very similar to Brun Cuivre and won't have picked it up, otherwise. 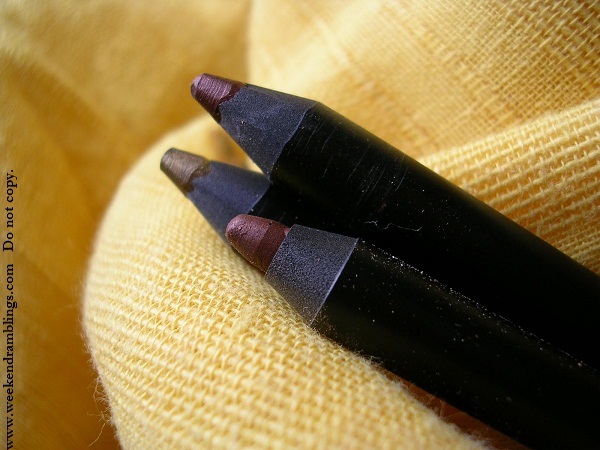 Each pencil come with a smudger at one end and a separate sharpener. They are easy to sharpen and stay smooth around the tip - no scary looking rough edges. The colours that I have with me at least don't smudge - as in smear and travel all over your face. They are easy to smudge when I want to but don't have wandering properties :P The SA though did tell me, though, that colours like Black smudge easily and need to be set with an eyeshadow if you don't want to look like a raccoon. Swatch: The second photo swatches are after I held my hand under running water for a bit. The product doesn't claim to being waterproof, though, and goes off easily with just regular face wash.
My verdict: Quality - Superb.